This plan is not Affordable Care Act (ACA) compliant. Traveling abroad is exciting and fun! However, without the proper insurance it is dangerous and could result in disaster. US residents traveling abroad may be surprised to discover that traditional health insurance sometimes offers less-than-standard coverage or may even be rejected while abroad. For this reason, State Department advises international travelers to purchase short-term medical insurance while outside the US. 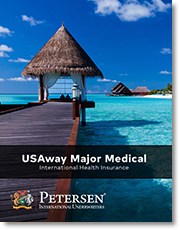 Wouldn’t your clients like to know that, despite the hundreds of potential misfortunes that may occur during an international trip, Petersen International Underwriters has them covered with the USAway Major Medical Plan? With PIU’s option to apply online, we offer the fastest service available. Mr. K. was snowboarding in the French Alps when he fractured his leg in the terrain park. Since this was not a life threatening condition his primary USA coverage did not cover the bill. Fortunately for Mr. K. he had an International Major Medical policy that covered the $15,000 medical bills. This policy offers medical coverage up to $5 million, along with other benefits to ensure a safe, worry-free trip. We will help your clients balance the financial consequences of minor problems, such as lost luggage, as well as catastrophes, such as serious injury or accidental death. The USAway Major Medical Plan is the perfect policy for Americans living or traveling abroad. Help your clients secure short-term medical insurance to protect themselves from the high costs of injuries and bad luck abroad.